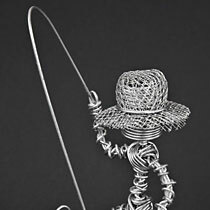 Male wire figure from Antigua. 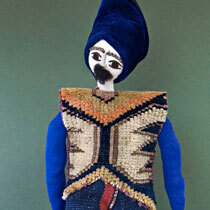 Handcrafted fisherman doll from Antigua. 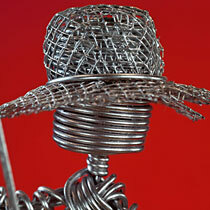 He is constructed entirely from wire. 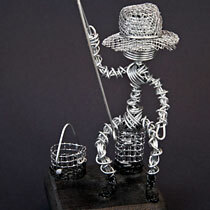 He depicts the culture of a fisherman and is sitting on a wire bucket, holding a fishing pole. 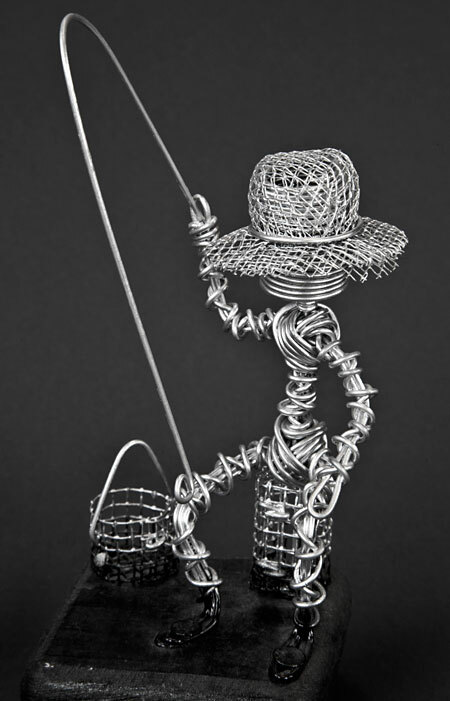 Another wire bucket with a handle is placed nearby on his wood platform. 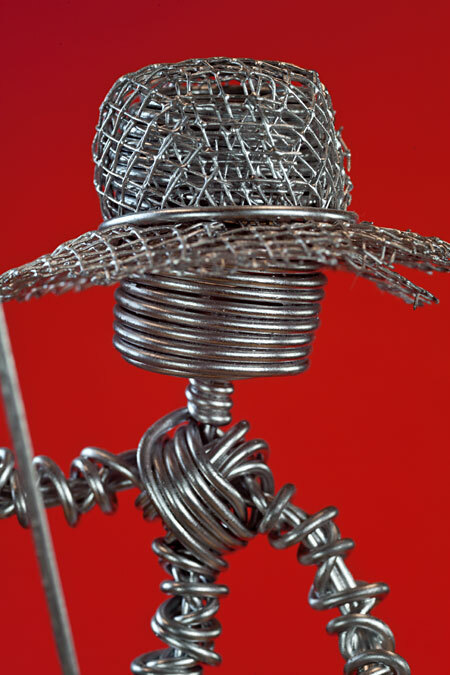 His body frame is twisted wire, and his hat is wire mesh. Tag says: “C. Roberts 2003” and the word “Antigua” is hand painted on the base. My dad owns a beautiful, 35 foot motor boat. 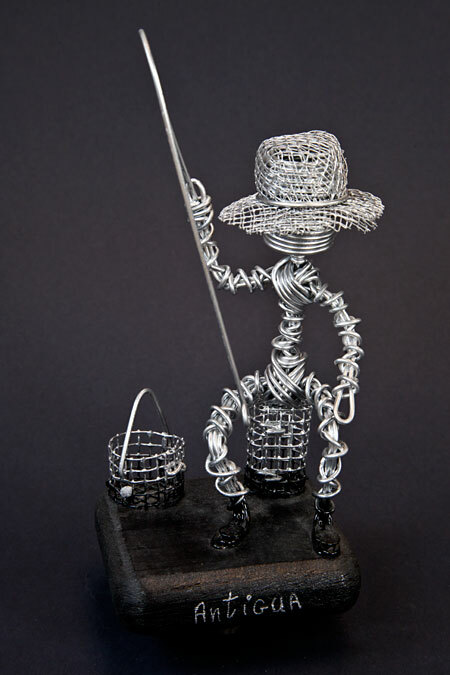 He makes a living by taking tourists on fishing trips around the island of Antigua. Some of the tourists like to relax and enjoy the scenery. Others like to fish for wahoo, tuna, or marlin. The name of my father’s boat is The Muriel. 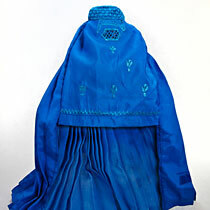 It’s named after my mother, who died in a car accident a few years ago. Dad taught me how to read the stars, and he showed me how to use an instrument called a nautical sexton. Stars and sextons can guide boats across miles of endless ocean. I also learned to use the very latest in radar and GPS (global positioning systems). On most days, we have about 8 tourists on board when we leave the dock in Saint John’s. As we glide away, my dad tells the tourists about the history of Antigua. 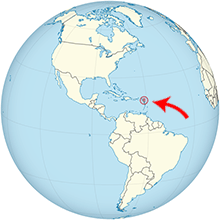 They find it interesting that Christopher Columbus “discovered” Antigua in 1493; but Indians and stone-people had lived here before that for over 3000 years! By 1684, the island was occupied by the British. They started large sugarcane plantations and brought over many slaves from Africa to work on the plantations. Most of the people living in Antigua now are descendants of those slaves. Antigua also has beautiful beaches and fields of bananas, mangos, and other fruit. The tourist office says that the island has 365 beaches—one for each day of the year. The coral reefs that surround the island are great for SCUBA diving and snorkeling too. My “job” is to serve as First Mate on The Muriel. I am in charge of the radar equipment and the radios. Most of the time, we use the automatic pilot, which gives me a chance to do other chores, like making our guests comfortable. One morning, about a month ago, my father told me he had to fly to Grenada for the day. After he left, I decided to take The Muriel around Antigua by myself. Antigua is only 14 miles long and 11 miles wide, so I knew I could make it in one day, and I knew I could do it alone! Before I started, I checked everything, including the gas tanks, the engine, and the navigational equipment. Then, I unhitched the stay lines, started the engines, and off I went. It was about three hours later when I heard the first thunder bolt. Soon the boat was fighting its way through the rough waters. Suddenly, a powerful wave lifted the boat and slammed it down with a force I thought might split the hull (the ship’s body) in half. I was thrown head first onto the deck. I lifted myself up and began climbing up to the helm, where the controls are located. Except for the rain and the wind, the boat was very quiet. It was then that I realized the engines were dead! I tried frantically to restart the engines, but they would not start. The radio was dead also—I could not call for help. I looked at the navigational instruments to try and figure out where I was. To my astonishment, I found The Muriel was way off course. I prayed that it would not run into one of the coral reefs! I had a dozen flares on board, but decided to wait until the storm calmed down before I used them. Sure enough, the horrible wind finally stopped and I knew the sun would soon be shining. For the first time in hours, I was able to look at the damage on the boat. My first thought was to send a distress signal to the Coast Guard. I tried the radio again, but it did not work. It was then that my heart filled with joy. In the distance, I could see the smoke of another ship. I fired two flares, and then I saw the ship turn and head towards me. It took almost an hour before the cargo ship got close enough for me to hear someone shout that they were heading toward Antigua and would tow me behind. A giant line was hurled on board The Muriel and tied down. Then, off we went. It took three more hours to reach Saint John’s. The men on board the cargo ship dispatched a radio message to my dad. Sure enough, there he was waving to me from the dock as we approached. I wondered if he would be angry with me. But instead, he had a big smile on his face! I could see that he was more concerned with my condition than the condition of the boat. I was lucky this time, and I learned my lesson – Always let Dad be the Captain!